The temporomandibular joint connects the jawbone to the skull. Up to 10 million people suffer from painful temporomandibular joint disorder (TMD), according to the National Institute of Dental and Craniofacial Research. Symptoms include pain in the face and neck, locked jaw or limited jaw movement, painful clicking when moving the mouth, dizziness, difficulty chewing or swallowing and a change in the way the teeth fit together. TMD is about four times more common in women than men. TMD has many causes, some physical, some emotional. A jaw injury, such as one caused by a car accident or being hit hard by a ball, can lead to TMD. 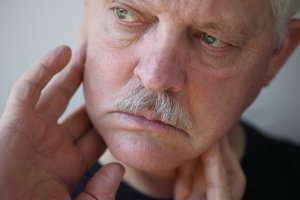 Degenerative joint disease is another leading physical cause of TMD. Emotional stress can cause behaviors that lead to TMD, such as clenching the jaw or grinding the teeth. You can manage TMD through medications or lifestyle interventions. Your doctor may recommend muscle relaxants or pain relievers. Certain types of antidepressants also relieve pain. If you clench your teeth at night, aggravating your TMD pain, your doctor might prescribe a sedative. These medications bring along a variety of side effects. Other interventions don’t require drugs. Rest your jaws by eating soup or soft food. Avoid chewing gum. Firm or soft bite guards sometimes relieve pain, and keep you from grinding your teeth at night. Ice packs or moist heat can help. A physical therapist can teach you exercises to strengthen and stretch your jaw muscles. If stress and anxiety are the cause of your TMD, try relaxation techniques. Mindfulness meditation, acupuncture, biofeedback, talking to a counselor or massage might help. In extreme cases, some doctors recommend surgery to repair this joint. Some patients with TMD find relief through chiropractic care. A chiropractor can manipulate your neck and jaw to improve alignment and relax muscle tension. Many chiropractors will also recommend special exercises, hot and cold treatment and other non-pharmaceutical interventions. Your chiropractor might team up with your dentist to provide the best care. If you’re suffering from TMD, call us today so we can help ease your jaw pain.